After all sales, Amazon India have come up with an offer where you can buy Kingston DT MicroDuo 16GB USB3.0 OTG Pen Drive at Rs 329 worth Rs 750. Hurry! It’s lightning deal. So join waitlist if deal is 100% claimed. 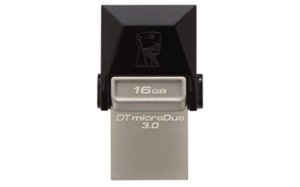 How to buy Kingston DT MicroDuo 16GB USB3.0 OTG Pen Drive at Rs 329? 1 . Visit here to go product page. 6 . Click on “Place your Order and Pay” >> Complete the remaining process and your order will be placed. 7 . You will get an estimated delivery date for your product. Till then relax and enjoy your discounted purchase on amazon using Dealnloot’s “Now Never Pay Full” wali deal. Thanks for stopping by. We share many more amazon deals, coupons, discounts. Keep visiting ! !